It turns out that winter can get a little long here in West Yellowstone. That leaves plenty of time to look back on photos and bring back memories of the warmer days of the past summer, and to look ahead to the upcoming season. Within two weeks I realized that I was working with some of the most respected, experienced, helpful, and genuine people in fly fishing, and everyone one of them was truly passionate about what they are doing here in West Yellowstone. 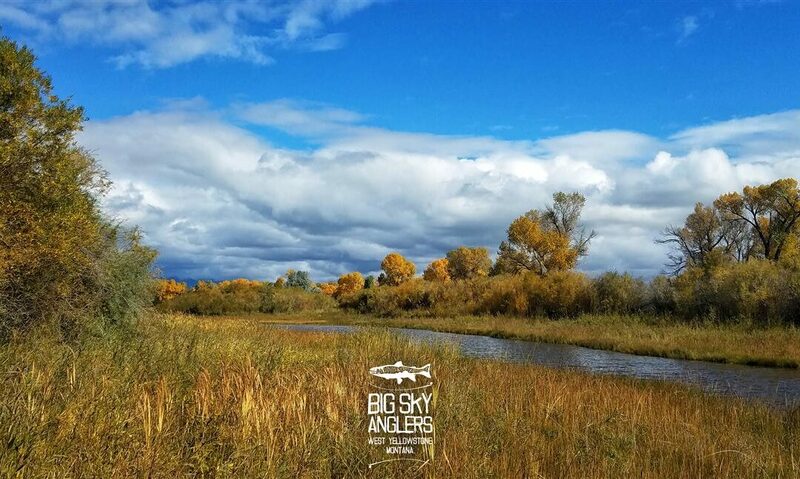 The owners and experienced crew at Big Sky Anglers introduced me to some of the local water, and also encouraged me to pull out a map, find a blue line or blob that looked interesting, and go exploring. Which brings me to talk the about fishing around here. Basically if you placed a drafter’s compass on a map centered in West Yellowstone and drew a circle with a radius of about 50 miles, you would be circling enough moving and still water to fish for rest of your life. Working for Big Sky Anglers and living in town for the 2017 season gave me the opportunity to merely scratch the surface of these special places. I grew up bass fishing in Southern California. In that setting, I fell in love with that feeling of tranquility of being on a motionless, glassy piece of water. But my ignorance and lack of exposure never properly mixed the joy of a calm lake with fly fishing for trout. Last summer, fishing on Hebgen Lake changed all that. There are many interesting fishing opportunities that present themselves throughout the season on Hebgen, but the Callibaetis hatches and spinner falls during mid-summer set things up for one of my favorite fishing games. It is truly exciting to witness big, healthy lake rainbows and browns choke down Callibaetis spinners like a hungry bear that just ended its hibernation. Imagine sitting almost motionless on a glassy lake with beautiful tall pines kissing the water’s edge. There you sit, waiting for the signal. You look down into the air and on the water for any cues of life. Actually, you are looking for signs of the end of life, since we’re talking about mayfly spinners here, but that’s getting a bit picky. In time, you see a brilliantly speckled Callibaetis as the boat slowly drifts over the water. 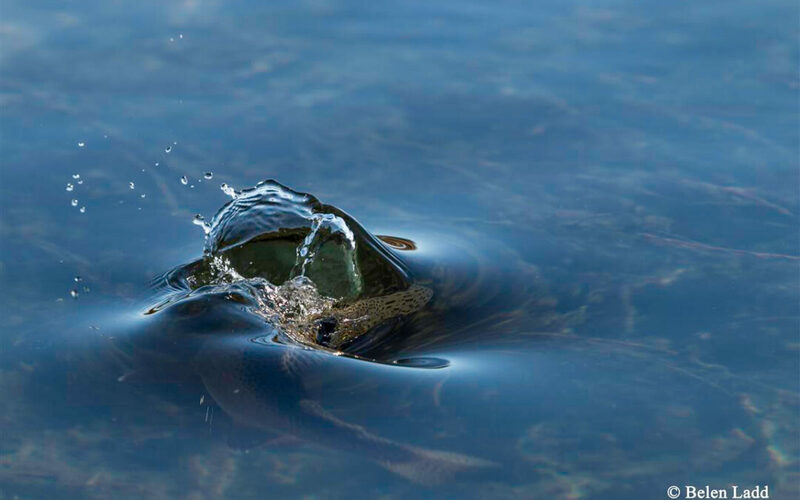 Then, more start to appear and you finally hear it – the gulping sound of a twenty inch rainbow trout arching its nose out of the water to inhale a Callibaetis spinner. It makes me smile just thinking about it. Mixing the emotions of hearing it with actually seeing it and it’s like tasting Nutella for the first time. You just can’t stop eating it. The challenge of successfully gulper fishing adds another interesting element to the pursuit. You can’t be messy at this game, at all. Only bring your A-game and be prepared to mess up a few times along the way. This angling is best done with a partner, or better yet a seasoned guide. One angler positions the boat and spots for rising fish while communicating with the other angler who holds a rod at the ready while also looking for trout noses. As you scan the surface, you are mentally preparing to make deadly accurate cast of anywhere from fifteen feet, if you are lucky, to sixty feet or more. Easy right? Some days these fish have a more rhythmic feed style and other times they’re what I’d describe as being “all over the place”. Hebgen’s gulpers can change feeding directions on a dime and will make you waist a lot of casts. If you shout out enough clock positions to your partner and have your line untangled and organized before you make your cast, you can catch a couple of these fish. They jump, run and dart for cover like you want them to and are truly a gratifying fish. I remember the first time I went out on Hebgen for gulpers with friend and Big Sky Anglers guide Donovan Best. My casting motions were too open which made the boat rock ever so slightly sending little waves out to the feeding fish. That slight and subtle error spooked several fish before I modified my casting stroke. Learning from my mistakes, and adjusting what I was doing resulted in a couple of fish that day, and the feeling of discovery was just fantastic!